I have read about mint.com many times and it has always been highly recommended for the usage of financial tracking. 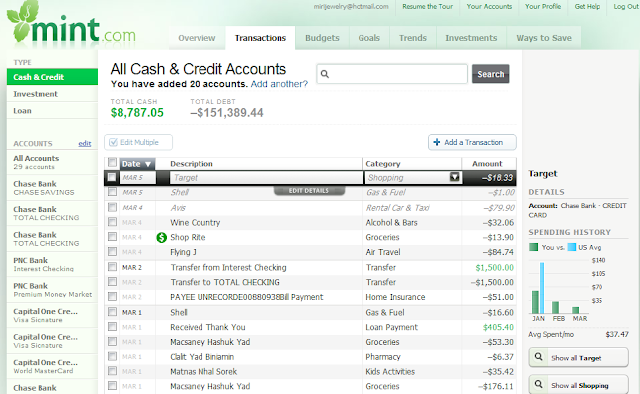 There are many other online financial tracking tools, but mint.com was one of the first to come out on the market. I decided to finally go ahead and try it. I AM IN LOVE! This is such an awesome website and sooo easy to use and its free! It just takes a minute to sign up and then it walks you through all the financial information you need to input. I can imagine that doing my taxes this year will be MUCH easier. I highly recommend this to everyone that has various accounts in various financial institutions, whether or not you have many credit cards and are playing the miles and points game. Mint.com takes all of this information and displays it in an easy to view fashion. 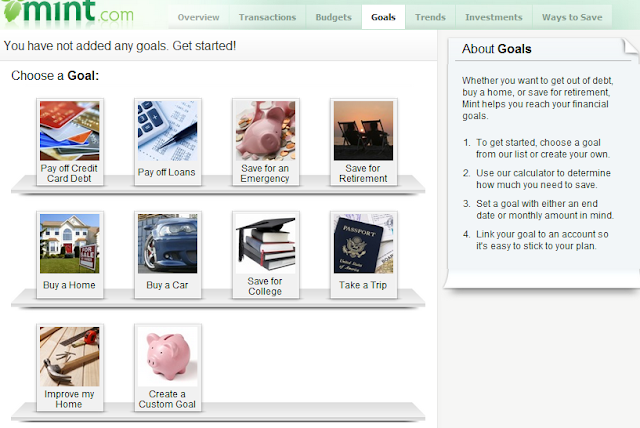 There are 7 tabs on the top bar containing Overview, Transactions, Budgets, Goals, Trends, Investments & Ways to Save. On the left sidebar from top to bottom you have listed all your Cash Accounts (ie. checking, savings, money market), Credit Cards (Line of Credits), Loans, Investments and then Property (Home/Vehicles). It then gives you your net worth by subtracting your debts from your assets. Below that, where it says "Trends", it will display your income and how much your spend is. 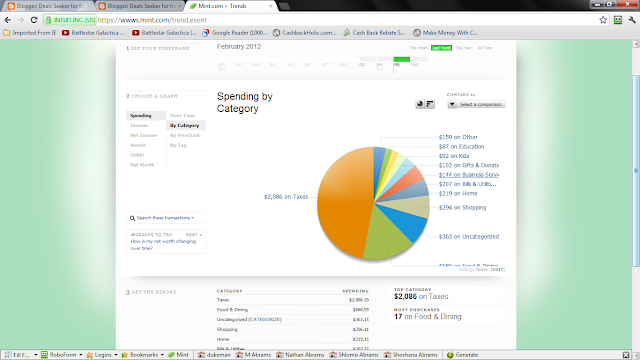 You can click on "see all Trends" to see how much you spend in each category in a graph and then in list form. On the right of the page from the top, you will see listed your alerts, these are the bills that are due soon. Click on "Change Your Alerts" to set up reminders to receive bill reminders via email or text messages to your email or Mobile Phone. 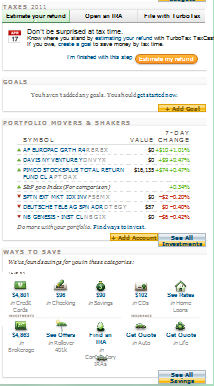 Next, you will see "Advice", these are recommendations for you from Mint.com. Then you will see your bills that are due in the next four weeks. Next you will see a graph of how much you have spent in each of your categories. You can add a category by clicking on the "+ Add Budget" button and view details of a category by clicking on the "See All Budgets" button. The next area is the taxes area. You can chose to estimate your tax refund by clicking on "Estimate My Refund". Mint uses Turbotax's Taxcaster to estimate your tax refund. To do this you must enter your wages, federal tax withholding's, state withholding's and unemployment income. The tab next is the "Open an IRA" tab, just click on "Get Started" and it will give you a simple quiz to help you chose which type of IRA is right for you. The third tab is "File With TurboTax". You can chose "I've filed my taxes" or "Get Started For Free". Next you can Add a Goal for yourself, which Mint will help you achieve. After that, you see an overview of your investment portfolio. Below that you can see the different ways you can save. 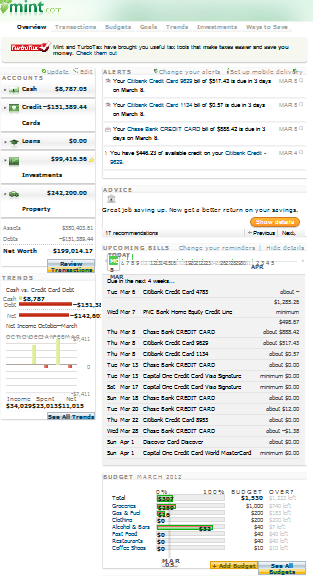 1) Cash & Credit - This is where you will find all the transactions on your credit cards. Mint chooses the category they think the transaction fits into and they give you the option to change it by clicking on an arrow under the category. You can even add your own custom categories. When you click on "Edit Details" you can change the category, chose a "Tag" and enter notes. On the right side, you will see that it says "Show All X", X being the Description. When you click on that, all the transactions that fit that description come up and you can change the category for all of them at the same time. You can even edit multiple transactions at the same time. Lets say, you wish to select all the restaurants you've been to on the list. You select them all, by checking the box on the left of each transaction. When you are done selecting, click on "Edit Multiple". You will be able to chose the category "restaurant" for all of them at the same time. First, you can select which month you would like to view. Then you can see how much your income was for that month and how much you spent in each category. Here is where you can set yourself a budget of how much you would like to spend in each category. Place your curser over a spend category and then click on "Edit Details". Here is where you can chose the amount you wish to spend in a month, every few months or once. You can also chose to rollover any remaining monies from your budget to the next month or few months, depending on which one you selected. Mint.com helps you reach your goals. Goals include, paying off credit card debt, paying off loans, saving for an emergency, saving for retirement, buying a home, buying a car, saving for college, taking a trip, improving my home or you create a custom goal. 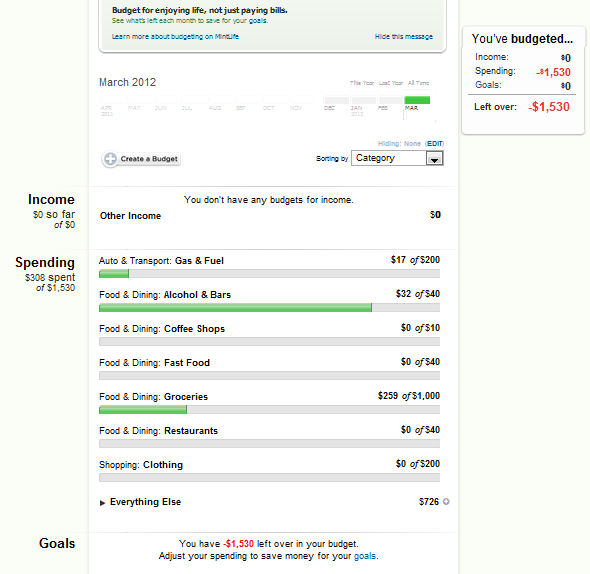 After you have chosen a goal you use Mint's calculator to come up with a monthly amount and/or end date. Then you choose which account to link your goal to. You will be able to keep track of your savings via Mint.com. You might think that the Budgets Tab is similar to the Trends Tab but the difference is, is that you can change the graph according to your specifications. You can chose to see a graph and list of your spending, net income, income, assets, debt and net worth by Category, Over time, by Merchant and by Tag. You can further filter by category or merchant and make various comparisons. This is a pretty flexible tool which can give you an abundance of financial data. This is the place you can view your investments and how they are performing. You can choose not to compare it with anything by selecting "none" or you can compare your investments against the Dow Jones, S&P 500 or NASDAQ. 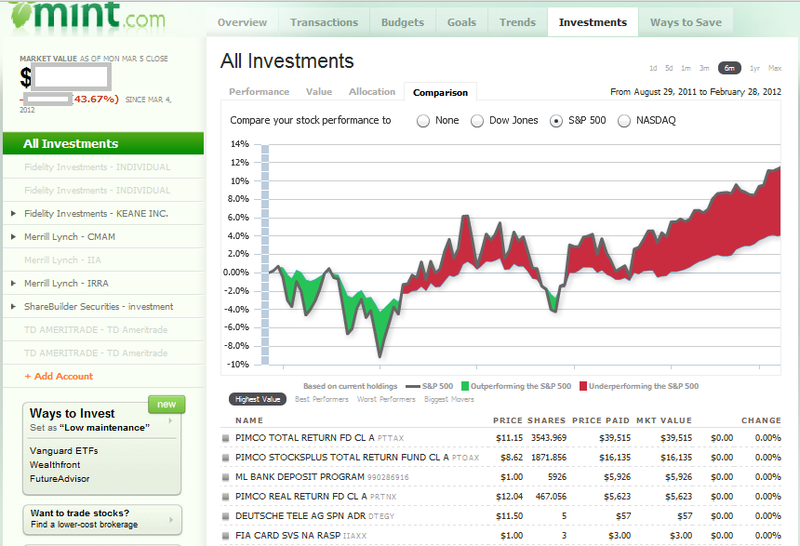 You will be able to see if your investments have underperformed or overperformed them. Click on "Want to trade stocks?" 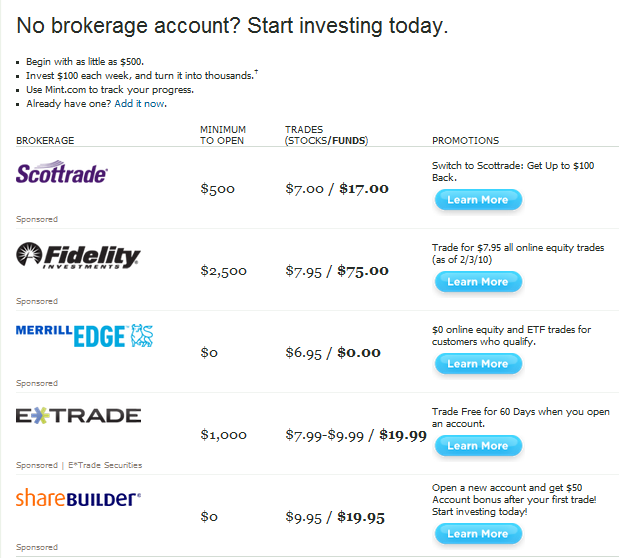 and Mint.com gives you options to trade stocks. See below. Click on "Do you have an old 401k?" and it takes you to a page where you can learn how much you will save if you rollover your 401k to an IRA. Mint.com provides a list of companies to get an IRA with, along with their special offers, fees and amount of funds they have. Click on "Get Growth & Tax Benefits" and find out which IRA is best for you, choose your investments and track its growth with Mint.com. In the Ways to Save Tab, Mint.com shows you many ways you can save and gives you recommendations depending on which tab you click on. The options are in the Banking, Investments, Insurance and Credit Categories. In Banking you have credit cards, checking, savings, CD's and Home Loans. In Investments you have Brokerage, Rollover and IRA's, In Insurance you have Auto and Life Insurance. In Credit you have places where you can get your Credit Score. They list freecreditscore.com by Experian and TransUnion. I was pretty impressed how they chose what credit card to recommend for you. They looked at your spend through the various accounts you have entered and figured out on which three categories you spend the most every month. According to that, they chose the right credit card for you and writes how much you will save with that credit card.